Meet Taste of Soul’s Hyundai Better L.A. 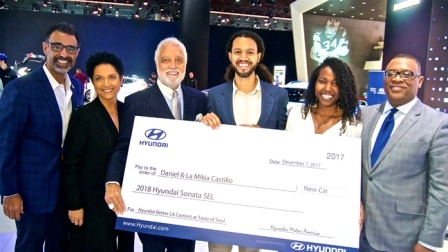 Contest Winners, Daniel & La Mikia Castillo; Hyundai teamed up with the Taste of Soul family festival to give away a 2018 Hyundai Sonata SEL, as part of its Hyundai Better L.A. contest, at the LA Auto show. Hyundai Motor America in partnership with Taste of Soul (TOS) gave away a brand new 2018 Hyundai Sonata SEL as part of its Hyundai Better L.A. contest. 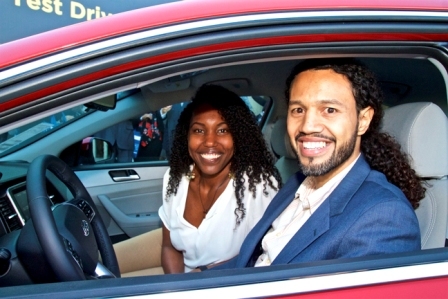 Earlier last week, married couple, Daniel and La Mikia Castillo were announced the winners of the contest during a ceremonial check presentation at the L.A. Auto Show. After receiving over 1,000 entries and reviewing 80 submission videos, selected judges were able to declare the top five videos which included entrant videos from Lonell Grimes, Venus Thomas and Marcus Anderson. However, the judges fell in love with the Castillos and their mission to make the city of the Angels a better place to live. Recently, the Los Angeles Sentinel caught up with the winners to discuss their push to make the community better and to hear all about their love story. The two have attended the TOS since the beginning of their marriage of ten years. Year after year, they continue to come out to the annual festival for vegan food and entertainment. 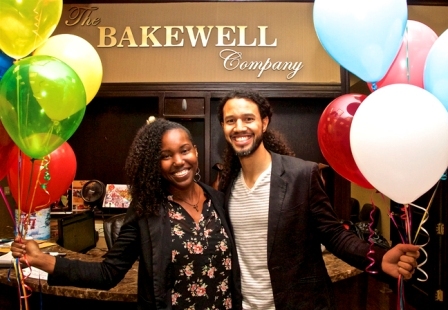 The couple also shares the same vision as TOS creator Danny Bakewell Sr., which is community investment. The two are constantly thinking of ways they can help the community thrive. It just so happens, the vision they had for the community coincides with Hyundai’s competition. The Castillos heard about the contest while they were attending this year’s TOS festival. The thing that drew them in was their niece’s attraction to the child-friendly photo booth stationed at the Hyundai tent. After being approached by a staff member at the Hyundai tent about the car giveaway, like most contest participants, the couple was hesitant about being bombarded with emails and giving away their personal information. The Castillos and their family walked away from the Hyundai tent and decided to give it some thought. Later, after being persuaded by family, friends, and falling in love with Hyundai’s concept for the contest, La Mikia and Daniel were ready to participate in the contest. And so, the preparation began. The two went home and began working on their video. Determining how they make the city better was the easy part. The more challenging issue was figuring out how to condense everything that they do into a 60 second video submission. After countless attempts, the couple almost gave up. 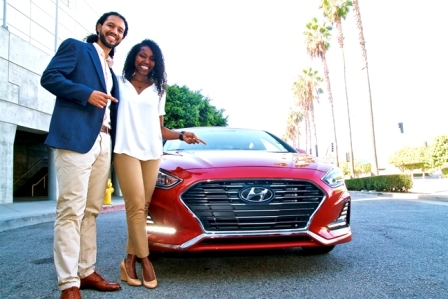 About two weeks later, Hyundai reached out to the Castillos to let them know they were selected as the winner’s for the Hyundai Better L.A. contest. “[Once we found out we won], we were in shock. We really couldn’t wrap our minds around this idea that real people actually win these contests,” said Daniel. Prior to winning the car, the two owned a 2012 Hyundai Tucson. Now that the Castillos have been gifted a new car, the reoccurring question is how are they going to share it? “The saying goes, ‘happy wife, happy life.’ My wife will have full access to the vehicle so whenever she feels like allowing me to drive it, I will drive it,” said Daniel. Both Daniel and La Mikia are Los Angeles residents. Daniel is the oldest child of nine and La Mikia is the oldest child of eleven. The two met at a local middle school in Los Angeles, however, they were also neighbors. Fast forward years later, the two began dating and as of August 25 of this year, they have been married for ten years. While the pair does not have any biological children, they are fostering a child. Taking part in the foster care system is vital to the Castillos. La Mikia grew up with and around foster children. Her grandmother, who is a foster parent, has raised many foster children and adopted three children through foster care. “We decided we wanted to go through the formal process of being able to care for kids in the foster care system because it is such a personal thing for us. It is important for kids who cannot be with their birth parents to be with a family that can help them navigate the system and provide them with the resources and love that they need,” said La Mikia Castillo. The couple has no plans for adoption anytime soon; however, if an opportunity arises and a child comes into their care and reunification is not an option, the pair would consider adoption. “With our current foster care situation, the goal is reunification. Right now our goal is to help provide a safe, loving home for our foster child until she is able to be reunited with her biological parent,” said La Mikia. Being involved in the foster care system is just one way the Castillos are giving back to their city. La Mikia’s turned her passion for fostering youth into an occupation and became a national organizing director for the National Foster Youth Institute (NFYI), where she has worked for the past two years. When she isn’t working at NFYI, you can find her teaching classes on the social context of urban planning and social innovation as an adjunct professor at the University of Southern California (USC), where she also received her master’s degree. Daniel is a devoted husband and humanitarian who has channeled his love for giving back to his neighborhood and youth through his job at the Social Justice Learning Institute (SJLI). There, he works as the institute’s Creative Arts and Youth Empowerment programs director. One of the first things the couple plans to do with their new Hyundai Sonata is drive their family around the block and back. After the couple’s weekly Thursday meeting with local foster youth in L.A., they let the youth take pictures in the car. Some even inquired about receiving driving lessons from the Castillos in the new car. Check out the Castillos Hyundai Better L.A. submission video at www.lasentinel.net. See you next year at the 2018 Taste of Soul family festival!